This blue is really the perfect blue, not too royal, not baby blue, not too loud or dark, just perfect. I only bought four from this collection and I have no regrets, but if I had them all they wouldn't bother me either, the bottle is cute and the glitters are pretty to look at. Wet n Wild did really good this year. By the way, this just reminded me of something funny that happened last month. I was in negotiations for an international nail polish exchange with a lovely lady (will post pics of the loot soon!) and we use a translating app to communicate of course. 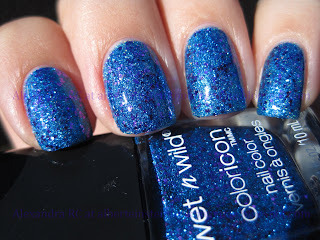 So I e-mailed her saying "OMG I just bought you Wet n Wild believe me, it's real! 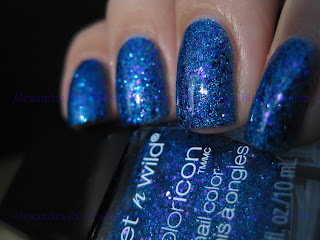 it's a blue glitter!" but I forgot to capitalize the name, and she replied "thanks, I believe you". Talk about getting lost in translation :) I then e-mailed her again explaining what had happened and we both laughed about the whole thing. 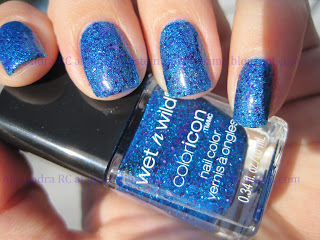 2 coats Wet n Wild Believe Me, It's Real! Ugh, i wish we had more brands in Australia. Cause this looks AMAZING! wish we had this in the Nederlands, love it ! I love blue glitters, and this is amazing! I agree with All Things Shiny entirely! I have all the polishes in this collection with the exception of the red one. They are all gorgeous but I can't seem to get them to look as smooth as you have here. Lovely swatches, thank you! Oh My!! That is gorgeous! I love it! I bought six of these but there were two I didt realize existed! I found this one. Can't wait to try it. I'm also trying to find Back Alley Deals (or something to that effect). 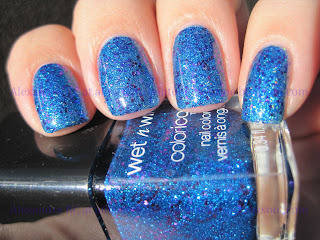 When I look at this polish, remember the email! Perfect on you .... amazing!! @ Sirena Sparklestar: thanks! Love your nickname by the way. @ All Things Shiny: there's a Nails Inc nail polish exactly like this one called connaught square, perhaps they sell it in your country? @ Shannara: hey you guys have Essence and Teeez! @ Kitties26: me too! This one is so sparkly you need it! @ Polish AMOR: aww :( my friend had the same experience, she lives in the east coast. @Nicole: Like I said, there's a Nails Inc nail polish exactly like this one called connaught square, perhaps they sell it in your country? @ SeeSarahSwatch: my fave is Back Alley Deals. @ Kaki: I think there's a Nails Inc dupe out there. O.O Such a stunner!!! LOVE this so much!